A Leicestershire waste carrier has been fined £3000 and ordered to pay an additional £877 after waste fell onto the highway on two occasions in 2018. Leicester Scrap Processors and Suppliers Limited, based in South Wigston, failed in its duty of care to ensure the waste being carried on their vehicle was under control and to take all reasonable measures to prevent waste escaping. This is contrary to Section 34 of the Environmental Protection Act 1990. On 31 May 2018 a significant amount of waste fell from one of the company’s vehicles onto the highway on the B5366 Countesthorpe Road. A resident who witnessed the waste being shed provided a written statement, helping Blaby District Council’s Environmental Health officers conclude that Leicester Scrap Processors and Suppliers Limited were responsible. Four waste operatives using two vehicles were required to clean up the waste, costing the Council £247. A second occasion, on 21 June 2018 saw a significant amount of waste falling from one of the company’s vehicles onto the highway. This was reported to Blaby District Council by another witness on the A426 between Whetstone and Lutterworth. The company appeared at Leicester Magistrates’ Court on Wednesday 09 January and pleaded guilty to both charges. 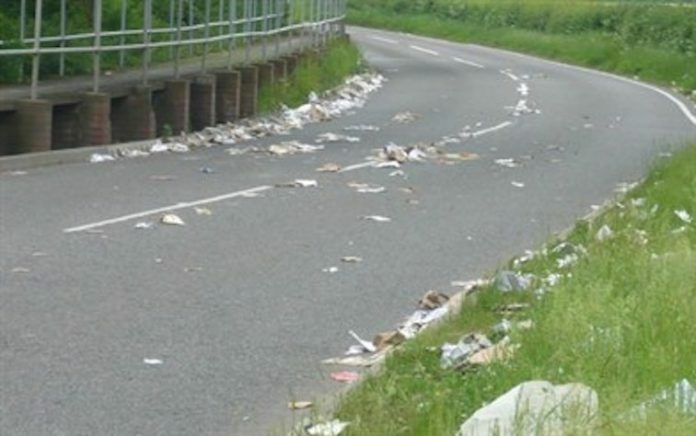 They were fined £1500 for each offence and ordered to compensate Blaby District Council for the £247 it cost to clear up the offence on the B5366. They were also ordered to pay a £170 victim surcharge and costs of £460. The £3877 must be paid within 28 days. Councillor Iain Hewson, Portfolio Holder for Leisure and Regulatory Services, said: “This is an excellent result for us. Companies must take responsibility for the waste they are handling. We will prosecute if we find companies are leaving waste in our district, whether carelessly or maliciously.